In N.K. 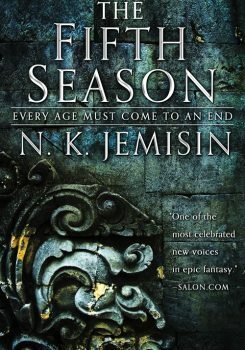 Jemisin’s novel “The Fifth Season,” the earth lashes back when humans begin to harm the planet—leaving behind a barren, broken world. The following is an excerpt of The Fifth Season by N.K. Jemisin. According to legend, Father Earth did not originally hate life. In fact, as the lorists tell it, once upon a time Earth did everything he could to facilitate the strange emergence of life on his surface. He crafted even, predictable seasons; kept changes of wind and wave and temperature slow enough that every living being could adapt, evolve; summoned waters that purified themselves, skies that always cleared after a storm. He did not create life—that was happenstance—but he was pleased and fascinated by it, and proud to nurture such strange wild beauty upon his surface. Then people began to do horrible things to Father Earth. They poisoned waters beyond even his ability to cleanse, and killed much of the other life that lived on his surface. They drilled through the crust of his skin, past the blood of his mantle, to get at the sweet marrow of his bones. And at the height of human hubris and might, it was the orogenes1 who did something that even Earth could not forgive: They destroyed his only child. No lorist that Syenite has ever talked to knows what this cryptic phrase means. It isn’t stonelore, just oral tradition occasionally recorded on ephemerals like paper and hide, and too many Seasons have changed it. Sometimes it’s the Earth’s favorite glassknife that the orogenes destroyed; sometimes it’s his shadow; sometimes it’s his most valued Breeder. Whatever the words mean, the lorists and ’mests agree on what happened after the orogenes committed their great sin: Father Earth’s surface cracked like an eggshell. Nearly every living thing died as his fury became manifest in the first and most terrible of the Fifth Seasons: the Shattering Season. Powerful as they were, those ancient people had no warning, no time to build storecaches, and no stonelore to guide them. It is only through sheer luck that enough of humankind survived to replenish itself afterward—and never again has life attained the heights of power that it once held. Earth’s recurrent fury will never allow that. Syenite has always wondered about these tales. There’s a degree of poetic license in them, of course, primitive people trying to explain what they didn’t understand… but all legends contain a kernel of truth. Maybe the ancient orogenes did shatter the planet’s crust, somehow. How, though? It’s clear now that there’s more to orogeny2 than what the Fulcrum teaches—and maybe there’s a reason the Fulcrum doesn’t teach it, if the legend is true. But facts are facts: Even if somehow every orogene in existence down to the infants could be yoked together, they could not destroy the world’s surface. It would ice everything; there’s not enough warmth or movement anywhere to do that much damage. They’d all burn themselves out trying, and die. Which means that part of the tale can’t be true; orogeny cannot be to blame for the Earth’s rage. Not that anyone but another rogga would accept this conclusion. It is truly amazing, though, that humanity managed to survive the fires of that first Season. Because if the whole world was then as Allia is now… Syenite has a fresh understanding of just how much Father Earth hates them all. Allia is a nightscape of red, blistering death. There is nothing left of the comm except the caldera ring that once cradled it, and even that is hard to see. Squinting through the red wavering haze, Syen thinks she can glimpse a few leftover buildings and streets on the caldera’s slopes, but that might just be wishful thinking. The night sky is thick with ash clouds, underlit by the glow of fire. Where the harbor was, there is now a growing volcano cone, gushing deadly clouds and hot red birth‑blood on its climb out of the sea. It’s already huge, occupying nearly the entire caldera bowl, and it has already borne offspring. Two additional vents crouch against its flank, belching gas and lava like their parent. Likely all three will eventually grow together to become a single monster, engulfing the surrounding mountains and threatening every comm in range of its gas clouds or subsequent blows. Everyone Syenite met in Allia is dead now. The Clalsu can’t go within five miles of the shore; any closer and they risk death, whether by warping the ship’s hull in the heated waters, or by suffocating in the hot clouds that periodically gout forth from the mountain. Or by cooking themselves over one of the subsidiary vents that are still developing around the area, spreading out from what was once Allia’s harbor like the spokes of a wheel and lurking like deadly mines beneath the waters offshore. Syen can sess every one of these hot spots, bright churning ragestorms just beneath the Earth’s skin. Orogene: One who possesses orogeny, whether trained or not. Derogatory: rogga. Orogeny: The ability to manipulate thermal, kinetic, and related forms of energy to address seismic events. From the book The Fifth Season by N.K. Jemisin. Copyright 2015 N.K. Jemisin. Reprinted with permission of Hachette Book Group. N.K. Jemisin is a Hugo-winning bestselling speculative fiction writer and reviewer. Her most recent work is The Stone Sky (Orbit, 2017). She’s based in Brooklyn, New York.